Book Review: The Madman's Daughter by Megan Shepherd - Book.Blog.Bake. Juliet is Dr. Moreau’s daughter, a prominent London doctor who ran out of town when news of his unorthodox experiments began and scandal befell the family, leaving her to believe him dead. After her mother dies, she takes work at King’s college as a maid, and a late-night trip to the college gives her a clue that her father may be alive. She seeks clues as to his wherabouts and runs into Montgomery, their old servant. He eventually informs her that her father is living on an island and she goes to seek them. Along the way, the ship picks up Edward, a castaway, and the three of them go to her father’s island. Once on the island, Juliet realizes the full extent of her father’s experiments: mainly, he has been stitching together animals to make something that resembles humanity. Juliet soon begins that little on the island, including her father and his creations, is safe, and she works to escape from the island’s many terrors, including the ones related to her. I have a bit of a strange reading habit where I really like gothic stories, but I hate scary ghost-and-zombie type stories. I think I like gothic stories because there’s this sense of fear that permeates them in a really subtle way, the kind of creepy that lingers in your brain for a little while after reading, but won’t actually cause nightmares. It can be a hard balance to strike, but I think The Madman’s Daughter did it pretty well. Even though I (mostly) knew what was coming the entire time, The Madman’s Daughter really built up suspense well. It’s the kind of book where there’s a lot of build-up in the middle of the book and it all culminates in a downright exciting last 70 pages. Even though I saw all the twists coming(which was a little sad, since I heard so many good things about the plot twists in this book), it was just such a heart-throbbing journey to get to that point. The plot is the best part of The Madman’s Daughter–well-executed, great timing, and thrilling. Juliet is a really bold female character for most of the book. She does things that are not taken lightly in her society. She’s shown to be smart, capable, and resourceful. She’s a character ahead of her time and it shows through. The other characters recognize this and sometimes chastise her, but she does what she wants anyway. Which is great. . . until it involves her love interests, which is where the book lost some of it’s great potential for me. There’s a love-triangle in this book, and it is not done well. I’m of the rare opinion that I actually do like love triangles if they’re well-done; so much so that I have a Goodreads shelf dedicated to this. The Madman’s Daughter did not end up there. I see no merit to the love triangle at all. The two love interests just weren’t different enough for me, and while I enjoy some book’s romance, the entire time Juliet was kissing either one of them or thinking about it I was thinking, “Enough! Stop kissing! You have a whole island of horrifying/exciting around you. I want to get back to that!”. At one point I thought I was going to have to put The Madman’s Daughter back on the shelf because of the horrifying factor, but once I got past one particular part it was definitely do-able. I will admit to skimming certain paragraphs to cut down on the blood–because there is a lot of blood in this book. It isn’t all that scary or gross, but it’s just. . . everywhere. I have a really weird thing with blood. I don’t mind giving blood or seeing my own blood, but I really hate seeing/reading/hearing about other people’s blood, so that’s definitely something I picked up on and something I’d be aware of if you have a similar feel as I do. The best part of this book was the last fifty pages–excitement abounds and the ending is . . . I don’t know what it is, but it’s the type that sticks with you. I saw the twists coming, but I did not see the ending coming and it’s the kind of ending that makes you want more immediately. A cliffhanger, but not one that felt overly gimmicky to me. Final Impression: The Madman’s Daughter does a pretty good job of maintaining a Gothic feel. I enjoyed Juliet’s character and her force of will, but I thought the love triangle was by far the weakest point in the book and brought it down a lot. It takes up too much time, it’s not well-done, and the book would have been more exciting without it. The plot was well-executed and left me wanting more. I’ll be eagerly awaiting the sequel, but hoping that the love triangle disappears all together(unlikely, but I will continue to hope). 3/5 stars. 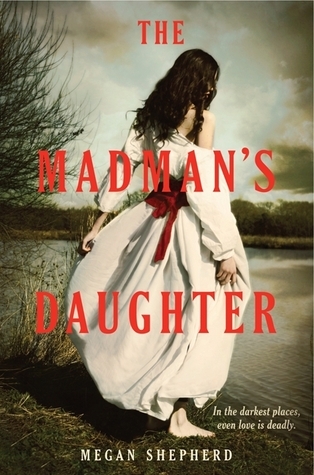 You can find The Madman’s Daughter at Amazon, Barnes and Nobles, or The Book Depository. The Sunday Wrap-up! (12) | Book.Blog.Bake. I was excited about the Madman’s Daughter when I first heard about it…until I started reading the reviews. Every single review mentions this awful triangle (and not one person was a fan), so I don’t think this is the book for me. Which is a shame because an YA adaptation of the Island of Dr. Moreau is such a rich, interesting premise. Oh, well. Great review! New follower via Bloglovin. I found your blog via Bout of Books. It really is probably the weirdest and useless love triangle ever(like, my least favorite), because it’s so unnecessary. I’m not even anti-love triangle, but this one was pointless. I really enjoyed it otherwise, but yeah, I’d definitely take it off the TBR if that’s a large factor. It’s really unfortunate because the book has a lot going for it, but the triangle is just distracting. I agree. That love triangle was kind of random and not necessary. I didn’t really feel her connection with Edward (I think that’s his name?). But I did enjoy this book. It was really creepy. Great review! I don’t even always hate love triangles, but this one was just so pointless! But I LOVED the atmosphere of the book! I’m excited for the next one. Yeah, usually once a love triangle starts it doesn’t disappear until the last page of the last book in a series! So sad. But I’m glad that other than the love triangle (and the many mentions of blood that bother you) you enjoyed this book! I don’t know why, but the cover catches my eye every time I see it so the cover whore in me wants to pick it up no matter what anyone says. Still, I’m trying to hold back and look at reviews! Great review, I think the book is still a possible buy for me!